Yet you won’t find an automatic dishwasher in any Amish home. Why the Amish choose to restrict technology is one of a number of puzzles deciphered in The Amish Way: Patient Faith in a Perilous World. Others include: Do Amish encourage Bible study? Why do Amish hold church every other Sunday? Do Amish accept outsiders who wish to join them? And just how do Amish ministers manage to preach, without notes, for up to an hour? The Amish Way is an accessible and compelling read answering these and many other questions on Amish faith. 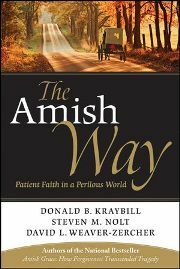 Today we have part 2 of an interview with Amish Way authors Donald Kraybill, Steven Nolt, and David Weaver-Zercher. If you missed part one of the interview you can read it here. Leave a comment on this post for 1 entry, share this contest on Facebook for 3 entries, or mention this contest on your blog for 5 entries (or do all three, for a possible total of 9 entries). If you share on Facebook or on your blog, email me at amishamerica@gmail.com to let know that you did and I’ll include your extra entries in the drawing. Winners will be drawn and announced in 2 days, on Wednesday the 13th. Amish America: How do Amish view Bible study? Donald Kraybill, Steven Nolt, David Weaver-Zercher: Like many other Christians, Amish people read the Bible as part of their private and personal devotional lives. Many families have morning and evening devotions, during which the father reads scripture to the family. But even though they use the Bible in devotional settings, they understand it to be primarily the church’s book, a resource that cannot be properly or fully understood by a lone individual, or even a small group of individuals apart from their local church. So while private devotional reading of scripture for personal inspiration is encouraged, in-depth Bible study that might lead to individualistic or novel interpretations is not. Those who show off their biblical knowledge or claim special revelation are seen as haughty and divisive. AA: What does the term “Amish” actually refer to? Is “Amish” a culture, a religion, something of both? Kraybill, Nolt, Weaver-Zercher: Participants in Old Order Amish life are participants in a religiously-rooted culture that has certain markers. The most important markers are (a) a commitment to an Anabaptist understanding of the Christian faith, including adult baptism and nonresistance; (b) plain dress; and (c) horse and buggy transportation. Of course there are many other markers that characterize the Amish way: they way they worship, the unique dialect they maintain, and their commitment to rural living. It’s a religiously-rooted culture in this sense: the markers identified above flow from a religious sensibility about ultimate matters. In other words, Amish conceptions of God and what it means to live a godly life have resulted in these markers. Other religious people, including other Christians, have their own set of religious commitments and resulting cultural characteristics. The ones listed above are particular to the Amish way. It is the case, however, that Amish practices reflect more than their religious commitments; their particular practices also reflect the fact that the Amish are Swiss-German in ethnicity, that they migrated to the United States, and so on. So in that sense, Amish culture cannot be reduced to their religious commitments. This is why some people who leave the Amish church—and abandon many Amish religious commitments—continue to think of themselves as Amish. AA: Amish retention rates are high, even exceeding 90%. What are the main reasons so many Amish youth choose baptism? Kraybill, Nolt, Weaver-Zercher: There are many factors that push Amish young adults in that direction. The vast majority of their family and friends are Amish, and they know that choosing another way of life will complicate and perhaps undermine those relationships. They are also socialized into the Amish way, and while they do have plenty of contact with the outside world, they are best equipped to be Amish (and, with only eight years of education, are not always well-equipped to pursue other things). In addition to those sociological factors, we think that most Amish children believe their way of life has more spiritual depth, and potentially more spiritual rewards, than other ways of life. Although Amish individuals are reluctant to claim with certainty that they are saved, they almost all believe that the Amish way is a safer way to attain salvation than more “worldly” religions. All these factors tend to push Amish young adults toward baptism. AA: Many Amish youth choose the Amish way, but Amish do not actively seek converts. In The Amish Way you note that only a few hundred outsiders have joined the Amish over the last century, with some converts later leaving. Why don’t Amish proselytize? What response might someone wanting to join the Amish receive? A non-Amish person who wanted to join the Amish would receive different responses depending on the person or community that person approached. Some Amish communities would tell the seeker that there are other valid ways to be Christian, and that the seeker would be best served to find a non-Amish Christian community. In other words, they would basically turn the potential convert away. Some Amish communities, however, are more open to considering converts. They may talk with the seeker to see if he or she is serious about exploring the Amish faith, and if the seeker is, invite the person to move nearby and begin learning about Amish life more fully. Only after the person has observed Amish life up close for a year or so—and only after the Amish community has learned to know the person well—will the Amish community extend an invitation to church membership. It’s quite possible, however, that the seeker or the Amish community will have decided by then that the person will not make a good Amish church member, i.e., a church member who is committed to the Amish way and able to submit him- or herself to the church community. AA: To what degree can non-Amish incorporate ideas for living from the Amish? What pitfalls might exist in seeking to apply the Amish way to a non-Amish life? Kraybill, Nolt, Weaver-Zercher: There’s a whole spectrum of possibilities here. Some people (though not very many) actually convert and become Amish. Still others seek to emulate their resistance to modern technologies, with the aim of devoting more of their energy to what technology scholar Albert Borgmann has called “focal practices”—practices that command a focused, locally-oriented engagement as opposed to practices that undermine our patience and undercut our attentiveness to our local contexts (for more on Borgmann, go to http://www.religion-online.org/showarticle.asp?title=2901). We do think there are pitfalls here, or at least an overly optimistic view by some people who think they can pick and choose particular Amish practices in ways that increase their spiritual depth. It’s hard to imagine a spiritual approach that’s more resistant to faddishness than the Amish way, so it’s ironic when aspects of Amish life become fads—things people try for a few weeks in hopes of transforming their lives. That’s why we think the best way to apply the Amish way to our non-Amish lives is to look for broader principles. For instance, we all know we live in an instant society, where we can often get what we want in a matter of minutes. Many people approach their spiritual lives that way. They look for quick, easy, and painless ways to grow spiritually, and they often end up disappointed with the amount of spiritual growth they see. The Amish point us to the importance of patient practice. They remind us that engaging in everyday practices, some of them quite tedious, over long periods of time is the most trustworthy way to foster spiritual depth. would love to win The Amish Way I didn’t get to enerty part 1 didn’t get the email thank for letting me entry your contest. Do the Amish care about politics?